At first it just seemed like a really great Sci-Fi movie, but I know right away people started thinking…maybe this could really happen? Honestly, it is hard to deny that THE TERMINATOR’s scenario would be everyone’s worst nightmare if Artificial Intelligence (AI) machines were to take over society, but apparently for some reason modern day science still wants to see how close it can get. During my Cognitive Science and Philosophy of the Mind coursework, I studied this topic of AI’s potential future role in the military and it is a topic that I am very serious about. I even contemplated going to grad school to study technology ethics so that I may join the philosophical conversation on this particular issue. 1) AI machines are man-made, but their “minds” are not programmed by humans to react in certain ways; they learn how to do this on their own and are autonomous. 2) I believe we as humans have a mind with a consciousness that does not exist in this physical world. * 3) Therefore, I believe that it is impossible to manufacture a “man-made mind” that is in any every way similar to a human’s mind, let alone one that can exist in an AI machine. Because of this I do not believe that an AI machine can possibly make the paramount ethical decisions that are required for military use, namely the decision of who to kill and who not to kill. I don’t think that mainstream society understands how often THE TERMINATOR film is mentioned regarding this particular issue, because philosophers bring it up all the time! We may think of it as an imaginary scenario, but I probably talked about it every day and in more than a handful of classes when I was studying philosophy of science for my bachelor’s degree. 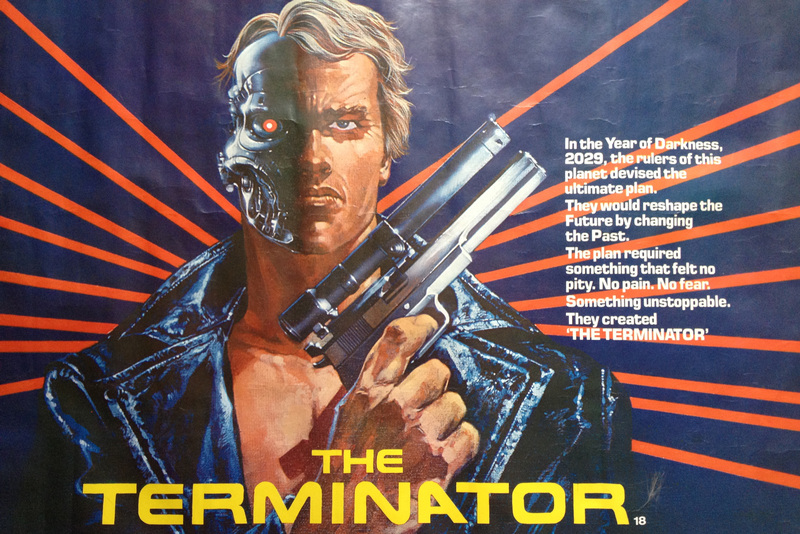 The above photo is cropped from an original TERMINATOR poster that I got while I was working at Pacific Western Productions (now Valhalla Motion Pictures), the production company that brought us the first 3 films in THE TERMINATOR series. Despite my distaste for AI in the military, I really love all of the movies from this saga…I’ll be back! *It should be noted that this is not the view of mainstream science. **Also a little credit should be given to Pink Floyd for the majority of my article title.